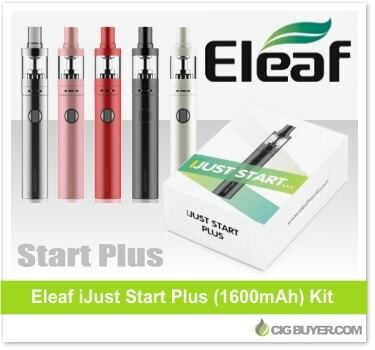 A larger version of the standard 1300mAh iJust Start Kit, the Eleaf iJust Start Plus Kit is perfect for newbies and makes vaping super easy. No need to worry about wattage, voltage, coil resistance, or any other complicated settings; just fill the included GS Air 2 Tank and puff away! The components are designed to work perfectly together on this direct voltage system, with almost no fiddling necessary. It offers 1600mAh of battery capacity, holds 2.5ml of e-juice and includes adjustable airflow to fine tune the draw. Available in several different colors, it comes with a removable drip tip and charges via micro-USB port.